"A fascinating account of the clubs austerity years"
"A gripping read, thanks to the author's meticulous research and keen eye for anecdotes and bizarre facts. A finely crafted, insightful piece of club history"
In this amusing, irreverent and fascinating account, Justin Blundell traces the events of the club's lost youth between the end of the Great War and the worldwide economic crisis that almost scuppered the club yet ushered in a new era under James Gibson. Along the way, we re-visit some of the most important events in the club's history; the extraordinary boycott attempt of 1930, the incident on the Moors that almost wiped out an entire team and the birth of the youth policy that paved the way for the Busby Babes and the glorious post-war period. One of the most perceptive descriptions of Manchester Citys play during their glory years was made by Manchester Evening News reporter Peter Gardner who said that When Youngy plays, City play. For all the talk in the intervening years of greats such as Summerbee, Bell and Lee, it was the local lad made good who made most impact when it mattered. A tall, leggy striker with a venomous left-foot shot, Young scored in every significant game for City in the late 60s. Scorer of two goals in the 1968 Championship win up at Newcastle, the scorer of the 1969 FA Cup Final winner and the first goal in the 1970 Cup Winners Cup final, Neil Young played as significant a role in the success and style of the Mercer-Allison partnership as anyone. Yet by 1972 he was allowed to leave the club as City began their now familiar relationship with underachievement and mismanagement. Thus starts Neils decline into illness and depression. During the next painful decade Neil suffered numerous illnesses, lost his family, his mother and survived a suicide attempt. Thankfully, he has emerged with his spirit intact thanks largely to the love of his third wife, Carmen. 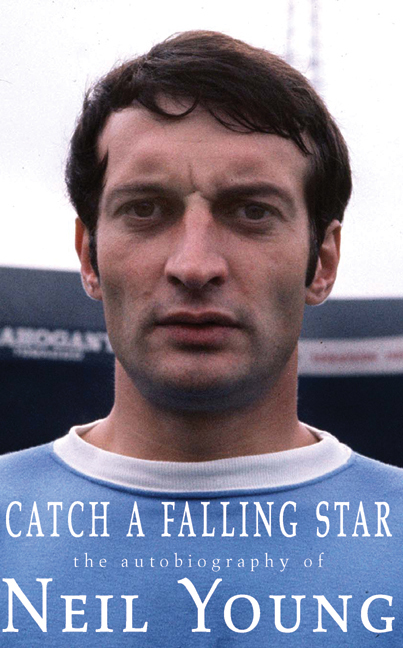 Catch a Falling Star is the moving tale of a how a star on the wane managed to mount a personal comeback as impressive as any achieved on the pitch by City's star-studded squad of the late 60s. In Quiz Setting Made Easy, John Dawson explores the very essence of human existence. In his case the answer to the ancient philosophical conundrum ‘What sets humans apart from the animal kingdom?’ is straightforward. It is not the ability to form tools, communicate or feel empathy with our fellow planet dwellers but our desire to acquire (and retain) as much trivia as possible. In brief, this is his explanation for modern Britain’s obsession with the pub quiz and the consequent growth in the number of question and answer books, many of which have been published under the misapprehension that all a budding quiz setter needs to succeed is a large enough selection of questions that can be adapted according to circumstance. Yet, as Quiz Setting Made Easy makes clear, there are many pitfalls for the budding Magnus Magnusson, not least the murmurs of complaint from contestants attempting to answer vaguelyworded and poorly researched questions. Then there are the potential disasters and the nagging doubts that bring the quiz setter out in a cold sweat in the middle of the night: Does the venue have a PA system? How do I make sure people turn up? What happens in the event of a tie? Who marks the questions, them or me? Written in light-hearted vein, Quiz Setting Made Easy is designed to soothe the quiz setter’s brow and bring back the fun to what is, after all, a leisure-time pursuit. In addition to his expert advice on the dos and don’ts of quiz setting, John illustrates the style and expertise required of the fully fledged question-master. With 72 rounds containing over 1,100 expertly worded questions, John Dawson makes enough suggestions for alternative topics, interval rounds, tie-breakers and music rounds to keep a quiz-setter going for years. His ideas could also be adapted for use in the classroom, during wet weekends in Cleethorpes or the 90 degrees heat of an M6 traffic jam... in fact anywhere humans pursue the trivial. John Dawson was born and brought up in Liverpool. He taught for some years in Oxford after attending university there, though he dedicated far more time to folk music and bar billiards than to anything academic. An itchy brain took him to Kenya, Egypt, and back to Kenya, where he earns a multifarious living as an editor, writer, and photographer. He is the co-author of the wildlife book Africa Alive.